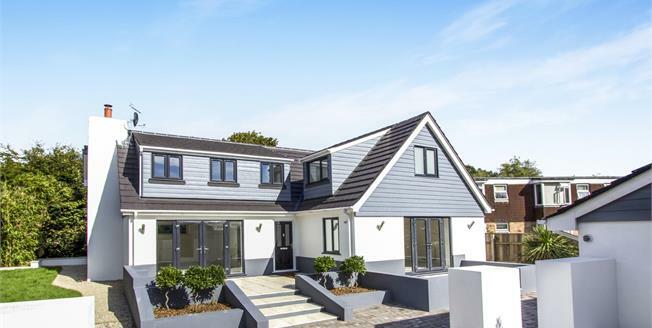 A brand new family home situated in a private lane close to the village centre. The property provides modern and contemporary living accommodation with a kitchen, family /dining room, lounge, three double bedrooms with an en suite to the master, family bathroom and WC/utility room. Externally the property offers a gated entrance with a landscaped gardens, brick paved driveway, patio areas ideal for 'alfresco' dining and an office/studio with shower room. Lounge 12'7" x 20'9" (3.84m x 6.32m). Kitchen Breakfast 14' x 17'5" (4.27m x 5.3m). Dining/Family Room 18'11" x 14'7" (5.77m x 4.45m). Storage Cupboard 3'1" x 11" (0.94m x 0.28m). WC/Utility Room 10'11" x 4'1" (3.33m x 1.24m). Shower Room 5'1" x 4'10" (1.55m x 1.47m). Office/Games room/Gym 17'4" x 11'4" (5.28m x 3.45m). Master Bedroom 12'7" x 20'11" (3.84m x 6.38m). En-suite 3'10" x 6'3" (1.17m x 1.9m). Bedroom 2 12'9" x 14'5" (3.89m x 4.4m). Bedroom 3 9'5" x 12'3" (2.87m x 3.73m). Bathroom 9'5" x 5'2" (2.87m x 1.57m).